Native American Facts For Kids was written for young people learning about the Caddos for school or home-schooling reports. We encourage students and teachers to visit our main Caddo website for more in-depth information about the tribe, but here are our answers to the questions we are most often asked by children, with Caddo pictures and links we believe are suitable for all ages. Photographs are the property of the sources we have credited. How do you pronounce the word "Caddo"? What does it mean? Caddo is pronounced "CAD-oh." It comes from their own name for themselves, Kadohadacho. The original meaning of that name isn't known for certain. Some Caddo people believe it comes from the native words for "true chiefs," while others think it was a place name that comes from the Caddo word for "sharp." Where do the Caddo Indians live? The Caddos are original residents of the southern Plains, particularly Texas, Oklahoma, Arkansas and Louisiana. Most Caddo people today live in Oklahoma. How is the Caddo Indian nation organized? The Caddo Nation has its own government, laws, police, and other services, just like a small country. However, the Caddos are also US citizens and must obey American law. In the past, each Caddo band was led by a chief chosen by a council of warriors. Historically, all these chiefs were male. Today, Caddo councilmembers and chairmen are elected, just as senators and governors are, and can be either men or women. What language do the Caddo Indians speak? Most Caddos speak English today, but some people, especially elders, also speak their native Caddo language. If you'd like to know a few easy Caddo Indian words, "kua'at" (pronounced koo-ah-aht) is a friendly greeting and "t'aybaw'ah" (pronounced tie-bow-ah) means "see you later!" You can read a Caddo picture glossary here. Today Caddo is an endangered language because most children aren't learning it anymore. However, some Caddo people are working to keep their language alive. What was Caddo culture like in the past? What is it like now? Caddo flag Here is a link to the Caddo Nation of Oklahoma, where you can learn about the Caddo people past and present. The Texas Indians and Texas Beyond History websites also have terrific information about the Caddo tribe. How do Caddo Indian children live, and what did they do in the past? Caddo girl They do the same things any children do--play with each other, go to school and help around the house. Many Caddo children like to go hunting and fishing with their fathers. In the past, Indian kids had more chores and less time to play, just like colonial children. But they did have dolls, toys, and games to play. In one Caddo game, kids tried to throw a dart through a moving hoop. Caddo mothers, like many Native Americans, traditionally carried their babies in cradle boards on their backs--a custom which many American parents have adopted now. What were men and women's roles in the Caddo tribe? Caddo couple Caddo men were hunters and sometimes went to war to protect their families. Caddo women were farmers and also did most of the child care and cooking. Both genders took part in storytelling, artwork and music, and traditional medicine. In the past, the chief and council members were always men, but today Caddo women can sit on the council too. What were Caddo homes like in the past? Caddo house The Caddos didn't live in tepees. There were two different types of Caddo houses. The eastern Caddos in Louisiana built tall beehive-shaped grass houses like the one in this picture. The western Caddos, in Texas and Oklahoma, built earthen lodges with thatched roofs. Here are some more pictures of Native American houses like the ones Caddo Indians used. Each Caddo village also included a temple and a sports field. Sometimes villages were surrounded by log walls for protection. No one lives in these old-fashioned dwellings anymore. Today the Caddoes live in modern houses and apartment buildings, just like you. What was Caddo clothing like? Did they wear feather headdresses and face paint? Caddo moccasin Caddo Indian men wore breechcloths, sometimes with leather leggings to protect their legs. Caddo women wore wraparound skirts and poncho tops made of woven fiber and deerskin. Both genders wore earrings and moccasins. Caddo men did not usually wear shirts, but in cold weather, both men and women wore buffalo robes. In colonial times, the Caddos adapted European costume such as cloth jackets and calico dresses. 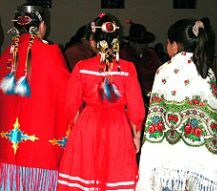 Here is a webpage with pictures of Caddo ribbon shirts, and here are some photographs and links about Indian clothes in general. The Caddos didn't wear long headdresses like the Sioux. Caddo men usually cut their hair in the Mohawk style or shaved their heads except for a scalplock (one long lock of hair on top of their heads.) Sometimes warriors would make this hairstyle more impressive with a colorful porcupine roach. Caddo Indian women usually wore their long hair in a bun. For special occasions, Caddo women fastened their buns with beaded hair ornaments and long trailing ribbons like this. Here is a website with pictures of these Indian hair styles. 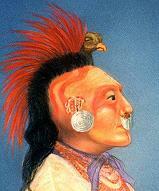 The Caddos also wore tribal tattoos, and women painted their faces and bodies bright colors for special occasions. Today, some Caddo people still wear moccasins or a ribbon shirt, but they wear modern clothes like jeans instead of breechcloths... and they only wear roaches in their hair on special occasions like a dance. What was Caddo transportation like in the days before cars? Did they paddle canoes? Beyond History.net) The Caddos knew how to make dugout canoes from hollowed-out logs, but usually they preferred to travel by land. There were no horses in North America until colonists brought them over from Europe, so the Caddos used dogs to help them carry their belongings. Today, of course, Caddo people also use cars... and non-native people also use canoes. What was Caddo food like in the days before supermarkets? Beyond History.net) The Caddo Indians were farming people. Caddo women harvested crops of corn, beans, pumpkins, and sunflowers. Caddo men hunted for deer, buffalo, and small game and went fishing in the rivers. Traditional Caddo foods included cornbread, soups, and stews. The Caddo Indians in Texas also mined salt from underground mines, which they boiled down to use in their cooking. Here is a website with more information about traditional American Indian food. What were Caddo weapons and tools like in the past? Caddo tomahawk Caddo hunters primarily used bows and arrows. Caddo fishermen caught fish and shellfish in basket traps. Caddo warriors fired their bows or fought with lances or tomahawks. Farmers used tools such as hoes and spades, which they made from wood, carved bone, and mussel shells. The Caddos also made axes with heavy stone heads for chopping wood. Here is a website with pictures and more information about American Indian weapon styles. What are Caddo arts and crafts like? Beyond History.net) The Caddos were most famous for their pottery. Caddo artists made elaborately decorated pots and bottles in many different styles. Here is a website of Caddo pottery photographs for you to look at, and another site on the history of Mississipian Indian pottery and other artifacts. Traditional Caddo art forms also include native basketry and woodcarving. What is Caddo music like? Caddo powwow drum The most important Caddo instrument is the drum. Caddo drums are very large. A group of Caddo men stand around the drum and play it together, while other Caddos dance in a circle and sing. Here are some audio clips of Caddo songs. You can see Caddo dances today at powwows, which are cultural festivals attended by many different tribes that are open to the public. What other Native Americans did the Caddo tribe interact with? The Caddos interacted frequently with all the other tribes of the Southern Plains, particularly the Osage, Comanche, Kiowa, and Quapaw. Sometimes the Caddos were friendly with these tribes, trading goods and intermarrying. Other times they fought wars against each other. Plains Indian tribes treated war differently than European countries did. They didn't usually fight over territory but instead to prove their courage, and so Plains Indian war parties rarely fought to the death and almost never destroyed each other's villages. Instead, they preferred to count coup (touch an opponent in battle without harming him), steal an enemy's weapon or horse, or force the other tribe's warriors to retreat. The Europeans who first met them were surprised by how often the Caddos fought with their neighbors, yet how easily they made peace with each other when they were done fighting. What kinds of stories do the Caddos tell? There are lots of traditional Caddo legends and fairy tales. Storytelling is very important to the Caddo Indian culture. Here is a story about Coyote trying to imitate other animals. Here's a website where you can read more about Caddo stories. Religions are too complicated and culturally sensitive to describe appropriately in only a few simple sentences, and we strongly want to avoid misleading anybody. You can visit this site to learn more about Caddo traditions, including a section on religious rituals, or this site about Native American religion in general. You may enjoy The Wonderful Sky Boat, which is a collection of traditional tales from several Southeastern tribes including the Caddos. For information about Caddo culture and history, one excellent source for schools is Caddo Indians: Where We Came From, written by a Caddo historian. Two nice overviews of Caddo culture for younger kids are Caddo Native Americans and The Caddo of Texas. You can also browse through our reading list of recommended American Indian books in general. Thanks for your interest in the Caddo Indian people and their language! An overview of the Caddo Native Americans, their language and history. Caddo language samples, articles, and indexed links. Related links about the Caddo Indians past and present. Would you like to help support our organization's work with endangered Caddoan languages?